There’s a lot of discussion about Superfast broadband, but what does that really mean? There are two speeds to think about – upload speed and download speed. Upload speed is normally only about 20% of the download speed, but unsurprisingly, broadband suppliers generally talk about the download speed – it sounds better! That’s fine if you’re only downloading the occasional email attachment or image, but if you’re downloading video or large images it can slow things down – not only for you, but for all the other people who are accessing the internet from your access point – that is of course if your network hasn’t been configured properly! Most broadband suppliers use OpenReach (owned by BT) so, if your provider is quoting speeds they’ll be the same regardless who the provider is. This also applies to Virgin, unless you’re on cable, which is a separate system. If you’ve got ‘fibre broadband’ that can mean all kinds of things. Fibre – which is the fast bit – typically delivers the broadband service to the nearest cabinet (that’s the green box at end of street), from there it’s the good old-fashioned copper wire. This is called FTTC, Fibre to the Cabinet, or vDSL, very fast Digital Subscriber Line. The speed is still dependent on your distance from the green box, (rather than the exchange) so it’s wise to check whether the figures quoted are what you’ll actually get, rather than, ‘up to’ figures. An alternative for business is a leased line, which is more expensive, but at least you know that the service is dedicated to your business and only your staff will be using it. Broadband providers don’t provide an exclusive connection, it’s a bit like airlines overselling seats on the assumption that not everyone will turn up; they assume that not everyone will be using it at once. 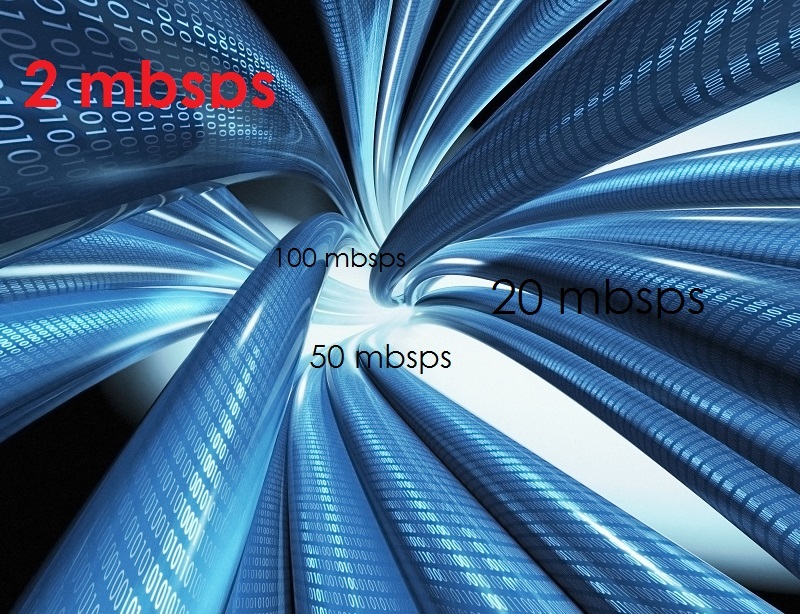 Typically, residential broadband services work on a 50:1 ratio (i.e. you share your connection with 49 other households), commercial services are more like 20:1. A leased line is one to one – all the bandwidth promised is yours. Of course, if you have many staff the service will need to be managed – but by your IT support team, not the internet company, so you remain in control. Lot of industrial areas don’t have a good broadband, they’re still using the old and slow ADSL connection, especially if they’re a long way from a local exchange. This means the signal is on copper cable all the way, meaning loss of signal quality and a reduced speed. Most rural areas fall into this area – so if you happen to be working in a business centre or industrial estate set in beautiful countryside, your broadband connection could be giving you a headache. BT focus on domestic market for their wide spread updates so, while you may have a super service at home, your office may be doing battle with a much slower broadband service. Now OpenReach are trialling a new VFast broadband service – which provides fibre slightly closer to you at the nearest junction box – usually inside a building, but this is still more common in domestic premises than business premises. Do check with your supplier, especially if you’re thinking of switching, exactly what their advertised download speed is – are the figures quoted the maximum, on a good day when the wind is in the right direction or realistic? They need to know what kind of use you intend for your broadband so you aren’t expecting miracles. 2mbps is not superfast on any day! If you’re struggling with suppliers who don’t seem to get that you’re trying to run a business, talk to specialists in IT for business. There are plenty of alternative solutions, we’ve connected clients who are a mile from the nearest broadband service and still get a robust service which we’ve beamed in with WiFi. Want to know more? Just give us a call on 020 7043 6030.